As I wrote in a previous blog post, I decided to reuse my old workstation computer as an Arch Linux Home Server. So far everything works fine and as expected. Overall, it's a pretty nice home server and development server to play around with virtualization and container technologies such as vagrant and docker. For example, I recently used a FreeBSD vagrant VM to build some FreeBSD images for my Raspberry Pi 3. However, the old system configuration didn't had enough disk space to store my multimedia files. Since 525GB isn't that much for storing multimedia files, I bought two additional SSD drives, namley two MX300 1050GB SSD drives. I know I could bought a bunch of hard disks with more disk space for the same price, however, I'm not a fan of mechanical hard drives due to their noise. That is why I went for SSD drives. 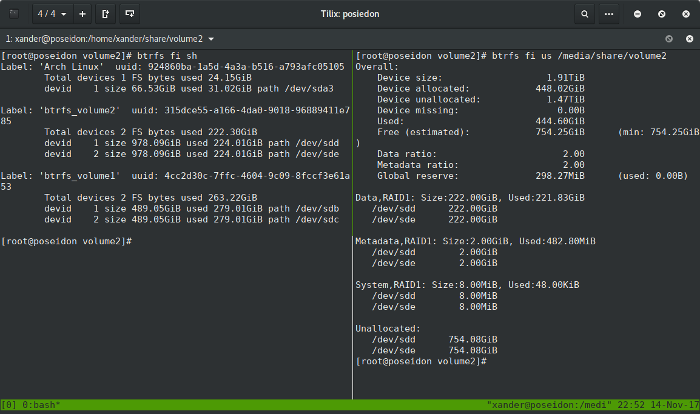 In this configuration, I decided to use the new SSD drives for a second BTRFS RAID 1 system. Once I installed the new drives into my machine, I started with the following hard drive configuration. For creating a simple BTRFS RAID 1 system, we only need to format the two drives using the command mkfs.btrfs -d raid1 -m raid1. On my system, I used the drives /dev/sdd and /dev/sde to build the new RAID1 system. The other two drives /dev/sdb and /dev/sdc are already in use by a BTRFS RAID1 system. As one can see in the following listing, I named the RAID1 system btrfs_volume2 and the formatting process went fine. To double check that new BTRFS filesystem was created, we can run the command btrfs fi sh to get an overview of all the available BTRFS filesystems on a machine. The output of the command is shown below. Note that the command is just a shortcut for the command btrfs filesystem show. In order to be able to use the new RAID1 system, we need to mount it. Here, it doesn't matter if we mount sdd or sde. In my case, I created the directory /media/share/volume2 to mount /dev/sdd. Additionally, I used the lzo compression option to save disk space. Lastly, we need to update the config file /etc/fstab. Otherwise, our system won't mount the filesystem on every new boot. Thankfully, creating or updating the fstab file is very simple on Arch Linux. In short, we can use the command genfstab to overwrite the old fstab file, as shown in the following listing. However, you should first backup your current fstab. So, that's it. My Arch Home Server features now a second BTRFS RAID1 system :-) and of course my wallet is now lighter too :P.